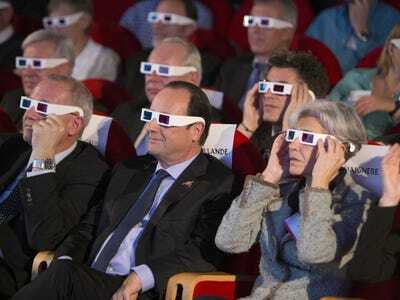 REUTERS/Jacques Brinon/PoolFrench National Centre for Space Studies (CNES) president Jean-Yves Le Gall (L) French President Francois Hollande (C) and former French astronaut Claudie Haignere wear 3D glasses during a visit at the Cite des Sciences at La Villette in Paris as they follow the successful landing of the Philae lander on comet 67P/ Churyumov-Gerasimenko, November 12, 2014. Good morning! Here’s what you need to know for Tuesday. 1. Five major banks, including HSBC, UBS, and JPMorgan Chase, were hit will $US3.4 billion in fines for failing to stop bankers from trying to manipulate the foreign exchange market. 2. Authorities also released transcripts as evidence of unacceptable trader behaviour. 3. Australia is monitoring four Russian warships that are nearing its waters. 4. The European Space Agency landed a probe, the Philae lander, on a comet for the first time in history. 5. Scientists are now waiting for more information from the probe and praying that it doesn’t bounce off the surface after a harpoon intended to stake the lander into the ground failed to fire. 6. By 2030, China has pledged to cap carbon dioxide emissions and make 20% of energy renewable, although experts say the measures don’t go far enough and it’s not clear how the country plans to achieve these goals, The New York Times reports. 7. Russia said its airforce will begin conducting air patrols from the Arctic Ocean to the Caribbean and the Gulf of Mexico for the first time since the end of the Cold War. 8. The pilot who survived last month’s Virgin Galactic disaster has told investigators how he managed to survive. 9.Hasbro is reportedly in talks to buy DreamWork Animation. , significantly less than the $US6 million Spotify CEO Daniel Ek claimed top artists would pull in over the next year. Former US presidents George W. Bush and Bill Clinton had a funny exchange on Twitter and Instagram.